Recording Software is a powerful tool in the home studio system, and is the link between you, your music, and your computer. It provides a user interface that allows you to manage, organize, edit, and playback your audio data. These software packages run on your computer and together with an Audio Interface form your Digital Audio Workstation, so this is why you'll see this referred to as DAW software. You'll also see it referred to as a "sequencer", or even "DAW sequencing software" if you're not into the whole brevity thing. Regardless of what it's called, this is where you actually press the record button to begin a session, add some digital effects, and make adjustments for the final mix. Check out the picture below. Each track is represented with a different color. Tracks can include vocals, lead guitar, rhythm guitar, bass, digital pianos, synthesizers, acoustic drums, drum loops... anything that you want to be part of the final project. A cool feature of many recording software packages is the ability to add MIDI drum samples to your music. You can load drum sounds the same way that you load samples of other sounds such as strings or organs. Many software packages also include drum loops which are a very easy way to add percussion without miking live drums or even programming a drum machine. The samples are stored in a library and you simply drag-and-drop them onto a track, then adjust the tempo and length accordingly. This is a great way to add drum sounds to a project for the non-drummers out there and it's included in many popular (and affordable) DAW software suites. Before you can choose an audio recording software package you'll need a clear picture of what you plan on recording and your budget. This is coincidentally also the list of the most expensive software packages available. These will certainly do everything you need but it's possible to spend a lot less and not compromise on the essentials. The good news is that you can't really go wrong with any of the software packages listed above, so if you have a ton of money laying around and it's wearing out the fabric of your pockets... feel free to plunk down a small fortune on a full professional suite. 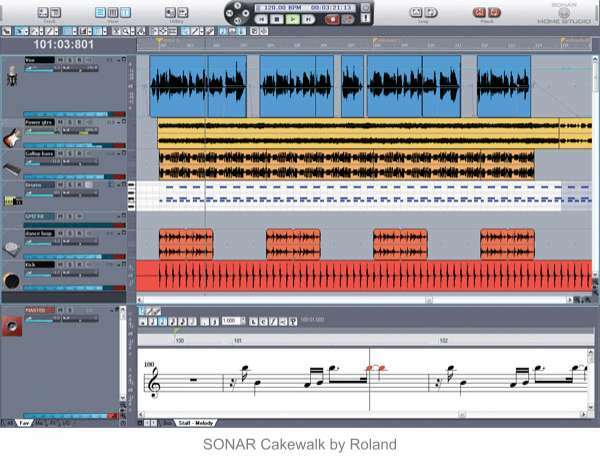 For the rest of us there are many other inexpensive alternatives such as Cakewalk's SONAR or REAPER. These can be had for a fraction of the cost of high end DAW software and still offer many of the same functions. Many manufactures offer a step down from the top-of-the-line editions called Lite versions, but they are anything but watered down. These will allow you to work with loops and samples and would fit right into a DJ rig. While any DAW software package will come with some included tutorials, I'd recommend picking up a supplemental guide for your recording software of choice. This will alleviate some of the frustration and confusion of getting your feet wet. Be prepared for a pretty steep learning curve no matter which one you go with, because the trade-off of capability is some added complexity. Time spent here will make your life much much easier down the road. In my opinion the best way to learn the software is to begin recording right away. Inevitably you will get to a point where you say, "I wish I could just do ______" or "There's got to be a way to do ______". Look up, experiment, or ask someone to learn that one small piece and pretty soon you start to accumulate a nice bag of tricks to pull from. Which One Is Best For My Home Studio?!? Basically, your final choice will come down to what you are trying to record, personal preference, but most of all if your machine is a PC or Mac. So my (super obvious) suggestion? and please do not buy a computer based on a piece of recording software you think is "the best". It's a myth - there is no best. Because if there was everyone would simply buy that version and there wouldn't be any choice at all. People will swear up and down that one is better than the other... but the best software to get is the one you will actually sit down and learn to use. If you buy the latest release of a software edition, expect to pay a ton... these things can really get expensive. For what it's worth, I use SONAR by Cakewalk and have gotten pretty slick at making it do what I want, but I'm sure I only use a fraction of its capability. Many companies offer a trial period where you can use the full version for as many as 30 days. You may not be able to save your work (annoying) or it may just lock you out after the trial period is up, but at least you can try before you buy. Just like buying a new car or finding an apartment, you should be able to tell pretty quickly if you like the interface and layout, or if it just isn't going to work. Don't be afraid to try a few and definitely don't be intimidated by not getting any particular brand. Remember that if you're just starting out, the software bundled with many Audio Interfaces provides basic recording and editing capability. You can always start with that before deciding to make an investment in a more complete digital software package. Also keep in mind that the more expensive DAW software out there usually costs more due to the inclusion of virtual instruments or other plug-ins. Do a little research to see what's included on each one and steer clear with confidence of any with 40 GBytes of organ synth samples if that's not what you're into. Finally, if you plan on collaborating with another musician it makes sense for all of you to use the same software. If you know someone who already uses a particular brand and version, why not give that one a shot? This will make sharing your work much easier and the added bonus being that you can help each other learn the software in a way that benefits your combined musical ideas. You will spend hours and hours before you begin to feel comfortable and confident behind the wheel of your new software. Think of it as an instrument itself and remember how hard it was the first time you tried to barre chords on a guitar (this F-chord hurts my fingers!) or played your first (non-chopsticks) notes on the family piano. With the right mind set and attitude you'll be cranking out those infectious melodies running through your head in no time.